They did, at the Unite The Right rally in Charlottesville. I believe the reference was in regards to Alliance building, not attending rallies controlled by our enemies for the purpose of getting as many of us hurt/jailed/vilified as possible. There's a time for marching in the streets and a time for building our strength so that we are in control of the streets where rallies take place. One is required before the other can occur successfully. ...not attending rallies controlled by our enemies for the purpose of getting as many of us hurt/jailed/vilified as possible. 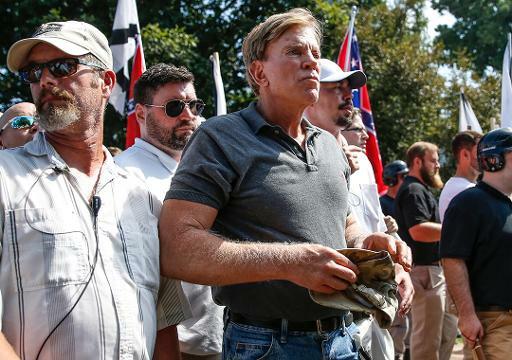 You should criticize David Duke, then - since he attended, supported, and spoke at Unite the Right. Are you suggesting Mr. Duke wanted to "get as many of us hurt/jailed/vilified as possible"? Public rallies have been counterproductive for decades. History shows us that. Dr. Duke has stated such a statement along those lines. Perhaps he taught this time would be different. It's the same everytime, post your gathering on some public forum, wait show up. The the opposition is there, with twice the numbers...Yell with a bull horn no one can hear you, get negative news coverage..lick your wounds...look at your website hits and membership applications..wow increase whoppeee . Coming out from behind your keyboard, could be as simple as telling someone about the cause, someone you think might be receptive. Dropping fliers, if you can afford to be doxxed. Hosting a dinner party for existing European Folk you might know..But public rallies, once again, appear to be counterproductive..
Hah, that's funny--suggesting that I believe David Duke wanted to get White people who are concerned about our future hurt. Tell me something, who was in control of that event at Charlottesville? It was the corrupted state and local governments in conjunction with the controlled (read that as Jewed) mass media, right? That's what I meant by "our enemies, right? How did I somehow imply "our enemies" include David Duke? David Duke was a participant in that rally, he was not in control. No reasonable person could say that he was. So please discontinue this silly business of turning my words around on me in order to vilify David Duke. If RetiredAndLivingOnAltairIV was an Alliance member he'd know from the monthly NA BULLETIN that David Duke stopped by our Tennessee headquarters on his way back home from the Charlottesville debacle to share a long lunch and brief me and a couple of other NA staff first hand about exactly what had happened in Charlottesville during the two previous days. When "Movement" hobbyists learned of that they spread around that I had helped organize the "Unite the Right" rally. They don't know me or the National Alliance. Why would we in the Alliance want to unite right wingers? Where are those united right-wingers now? Did they go back behind their keyboards after their Charlottesville rally? I don't follow what the alt-right crowd does, but from what I've heard It looks like alt-right has gone the way of the Tea Partiers and the Populist Party before them. Maybe something will come out of that right wing meeting in a park near Nashville this weekend, sponsored by the Council of Conservative Citizens and the League of the South. I believe David Duke will speak there also, along with Kevin McDonald and Rick Tyler, the fellow who's running for governor of Tennessee. Could the Alliance attempt to recruit from those attendees? Some activism along those lines is better than none--if the meeting organizers would allow it-- but it's difficult radicalizing conservatives when their bellies are full and they look forward to watching the ballgame after hearing speeches on reforming the system or identifying problems without proposing any truly effective and revolutionary solutions. A few attendees might be worth reaching out to though, those few who can see that the entire mess has got to go. If I lived somewhere near Nashville, I'd give it a go. Oh boy, another Charlottesville (or for those who remember York, PA in the early 2000s) in the making. Why not just tell antifa that they're going to get another crack at some well-meaning Whites with Jewed media and police covering up their violence? Marching in enemy-controlled streets has been shown to end in debacle after debacle for Whites so let's learn from this. Just to avoid being another negative nay-sayer, I have a constructive suggestion. Load up the entire area with information on AIDS and other STD's the perverts, drug-users, and non-Whites like to spread in the form of a flyer or what have you. The Alliance has had a history of producing a 3x5 sticker for just this purpose and perhaps it can be updated and posted to the natall website for downloading and printing onto neon-colored cardstock. Also, 2-3 man squads would be ideal for tagging cars, doorknobs, storefront locations, and so on quickly and without the stupidity of announcing where and when you're going to be as this 'protest' is doing now. Think of it as a "propaganda blitz" technique where a squad moves into an area, distributes a few hundred pieces of information, then moves to an entirely different area and does it again. And again. And again---til the flyers run out. Hell, purchase a billboard ad or tv/radio time if there are enough of you who can come up with the funding.